Looking for some Halloween fun this fall in the New York City area? 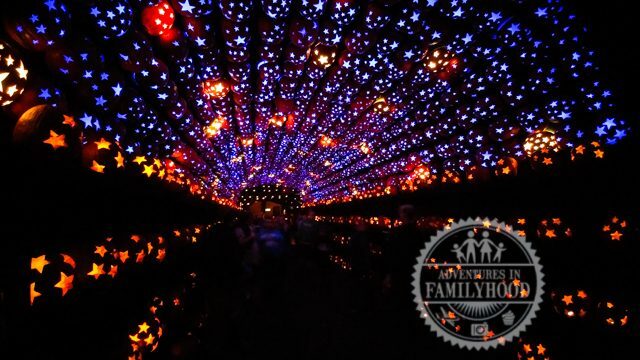 I highly recommend taking the family to see the Great Jack O’Lantern Blaze in Historic Hudson Valley! 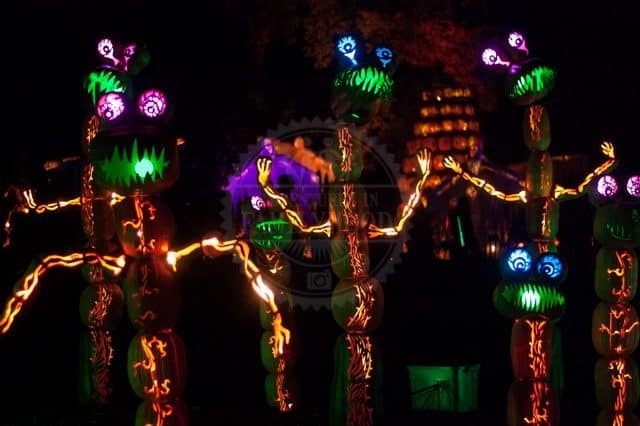 Here are 5 reasons to purchase your tickets to #pumpkinblaze right now! 1. Over 7,000 Hand-Carved Jack O’Lanterns! Seeing a single jack o’lantern is nice. A whole row of jack o’lanterns is cool. 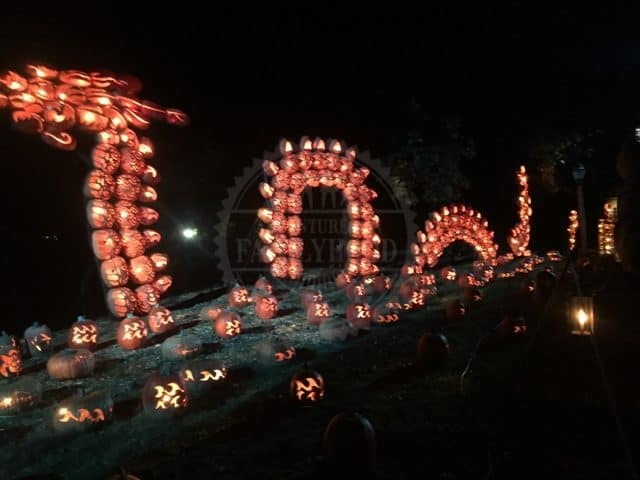 Walking through an entire landscape of thousands upon thousands of hand-carved jack o’lanterns is simply AMAZING! 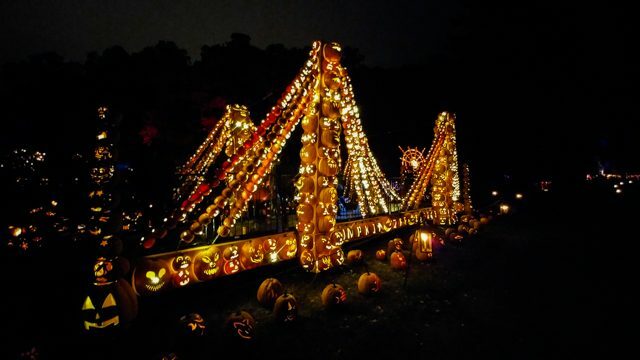 They spend months getting ready for the Great Jack O’Lantern Blaze, and it shows! The carvings vary from simple faces to intricate designs, and even the archway the marks the entrance is made from carved jack o’lanterns! These are not your usual jack o’lanterns. The Blaze takes the art the jack o’lantern to new levels. They use all shapes and sizes. 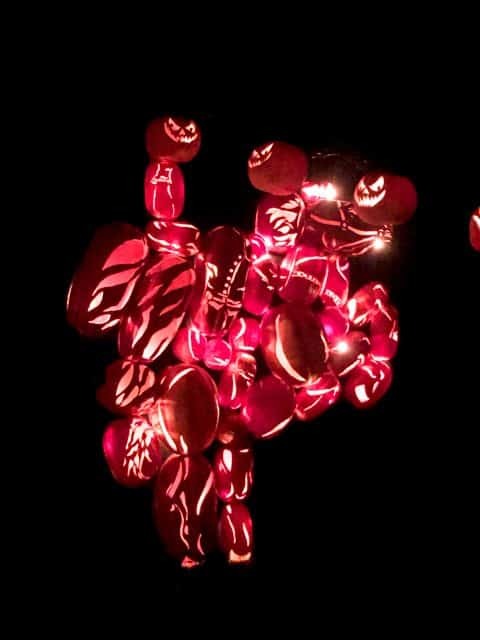 And by combining multiple pumpkins into sculptures, the Great Jack O’Lantern Blaze creates incredible scenes that you wouldn’t have thought possible. Some of them even move! The jack o’lantern creations are spooky, fun, interesting, and sometimes downright WEIRD! The display covers a lot of ground, and requires a bit of walking (about 45 minutes). Even so, there are plenty of spots to linger and take your time with. 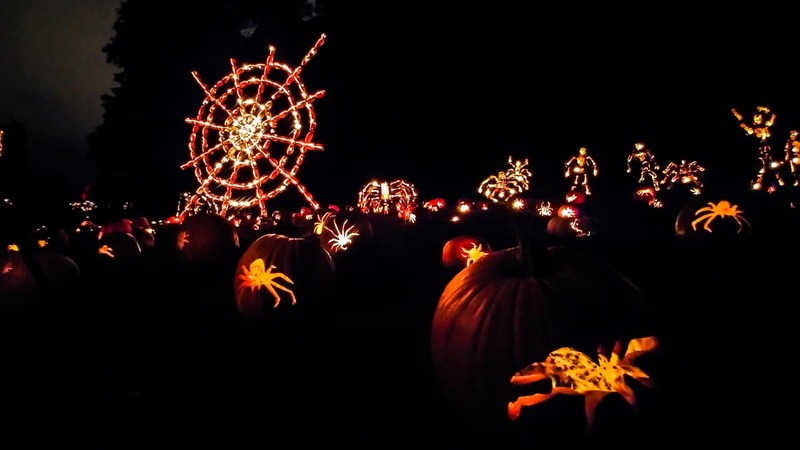 Your family will definitely want to marvel at the music and light display of the jack o’lanterns that adorn the railings of the eerily lit Van Cortlandt Manor. It’s like a mini show within the display! Is there a more famous ghost for this time of year than the Headless Horseman? 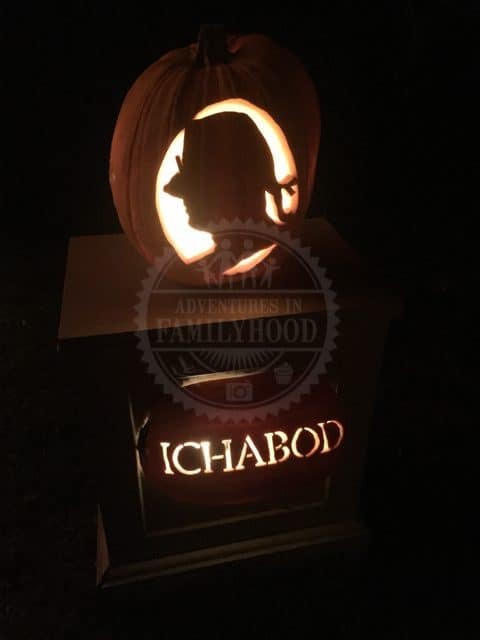 Since The Blaze takes place in the heart of the land that inspired the famous tales by Washington Irving, it wouldn’t be complete without the tribute to this legendary specter… entirely made from pumpkins, no less! The truth is, your skin will feel extra tingly in the crisp air of Sleepy Hollow country on these nights. The Legend of Sleepy Hollow truly comes alive this time of year! 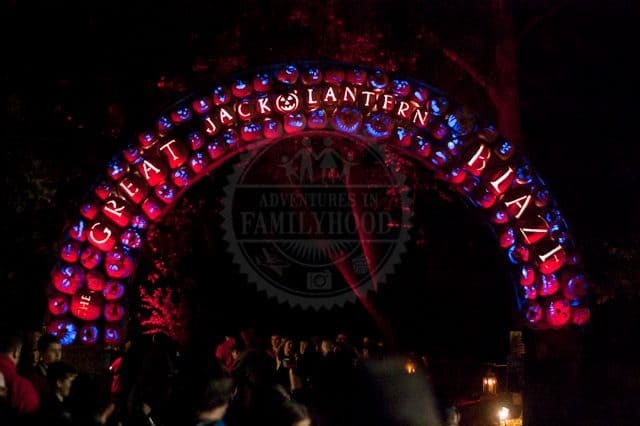 The Great Jack O’Lantern Blaze would be still be great if it were held somewhere else. But being held in the land that inspired the ghostly tale of Ichabod Crane and the Headless Horseman makes it so much more thrilling! 5. 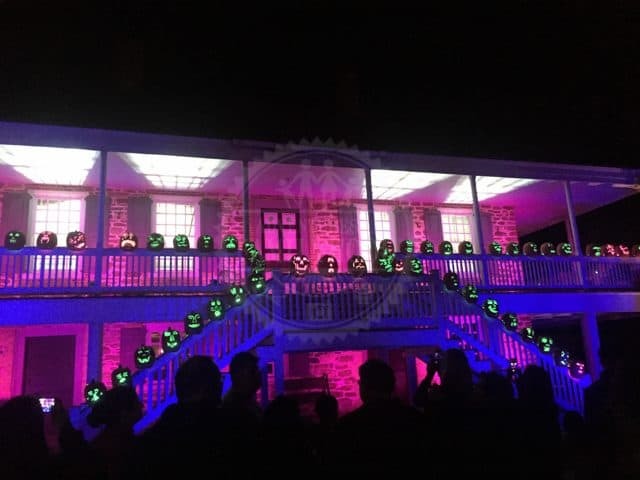 The Great Jack O’Lantern Blaze Keeps Getting Better! This is the 14th year of the Blaze! 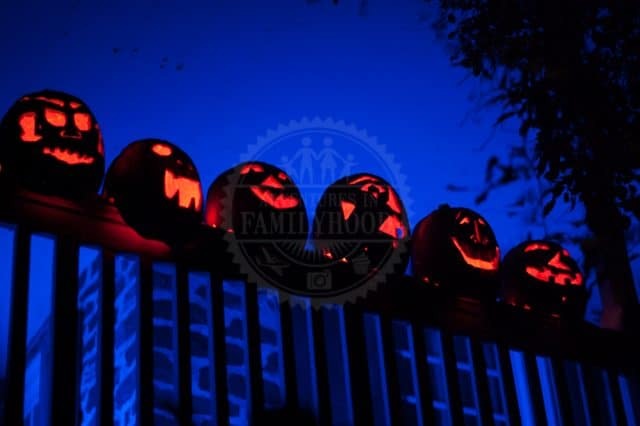 And even if you seen it before, The Great Jack O’Lantern Blaze is always adding new things to delight your family. Last year we were impressed with the pumpkin Statue of Liberty and amazed by the pumpkin carousel. This year, the Blaze has a full set of Instagrammable zodiac signs, as well as a medieval castle! 2018 Dates: Sept. 28-30, Oct. 4-31, Nov. 1-4, 7-11, 15-17, 23-24. Tickets: Purchase tickets in advance!!! Online tickets are $22 for adults ($27 on Fridays and Saturdays), $16 for children 3-17 ($20 on Fridays and Saturdays), and free for children under 3 and Historic Hudson Valley members. If you order by phone there is a $2 surcharge per ticket. FAQ: I could list a bunch of things here, but I think you’ll get a kick out of the humor of reading through the FAQ on the official page for the Blaze here. There are snacks and beverages sold at the event. Port-o-potties available. While the walkways can be narrow at points and have inclines/declines, you can use a wheelchair/stroller.